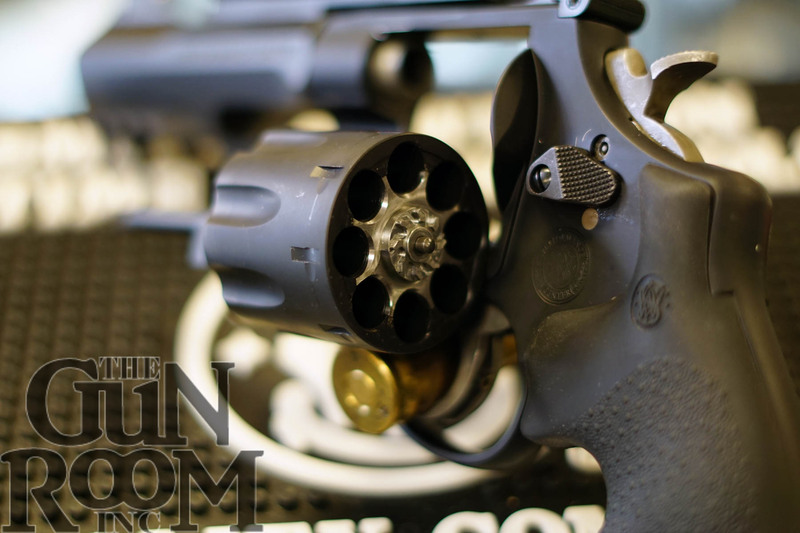 Smith & Wesson R8 – The Gun Room Inc.
Not unlike the Smith & Wesson R8 The Smith & Wesson TRR8 model 327 comes with rails top and bottom that are removable. 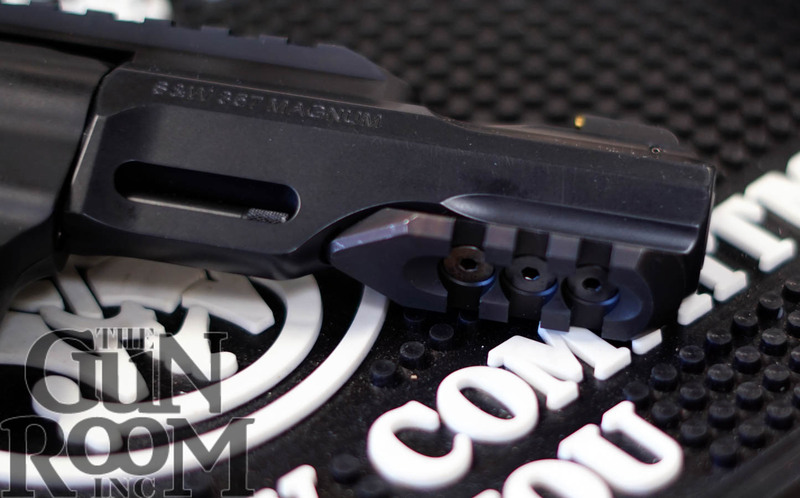 The Smith & Wesson R8 has a fixed under-lug rail that is non-removable while the TRR8 has an under-lug rail that easily comes off for those of you looking for easy N Frame holsters out there. 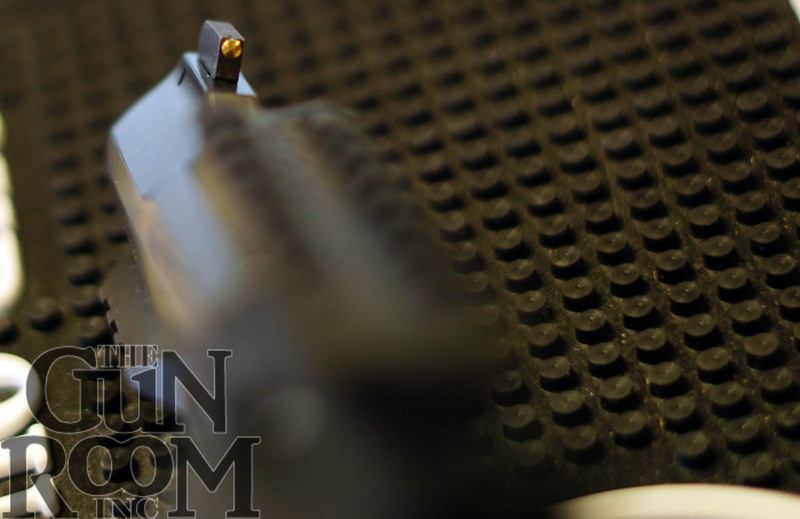 The TRR8 also is cut out on the opposite side of the barrel shroud in efforts to make it lighter and quicker pointing. The Smith & Wesson TRR8’s front sight gets the brass dot treatment as an upgrade where the Smith & Wesson R8 has the more standard white dot. Going rearward on the TRR8 we find a fully adjustable notch that is usable while the top strap rail is installed and on the R8 tested we find the same adjustable sight but in “V” notch configuration. Both sighting systems are easy to acquire and put rounds on target as if they were put there by a laser the shooting is so precise. The Smith & Wesson TRR8 also sports a cylinder that is cut for moon clips making charging 8 rounds immediate and positive. Mike is loving the moon clips on his R8 and even ordered more so he can shed lead like all of the hi-capacity guys at the range. 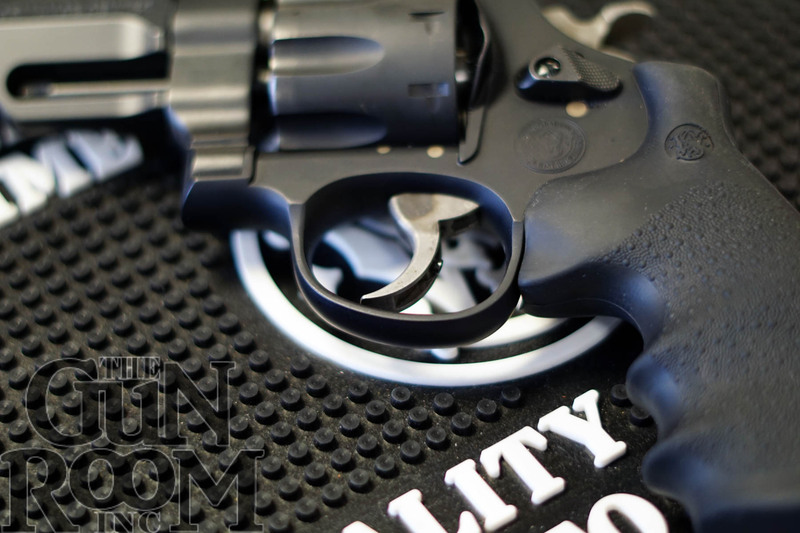 This moon clip system is fooling everyone on the R8 and TRR8 because reloads are so fast and the authority of the 357 Magnum round makes them all take notice and question the validity of their 9mm. 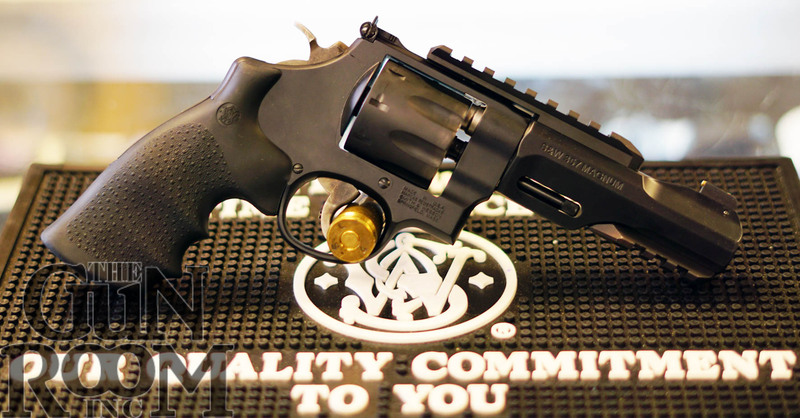 As in the R8 version the Smith & Wesson TRR8 features a Performance Center tuned action with trigger stop that allows for ultra-fast shooting Michulek style and immediate trigger reset for fast follow up shots if you need more than one .357 Magnum for anything. The Smith & Wesson TRR8 seems to do duty anywhere it’s deployed and makes a great home defense or woods gun for when it’s not on duty. The Gun Room Inc. has this model in stock today for those S.W.A.T. Teams or Special Forces units where in-fallible reliability are key to mission success. For those of you just looking for a great gun that shoots phenomenal and has the power of the 357 Magnum in 8 shots give us a call (503)777-3931.